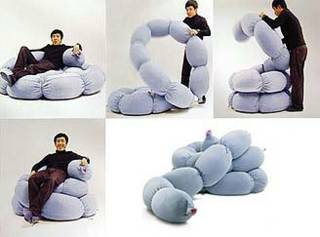 It's not often you find a piece of furniture that sounds like a swear word and looks like the plush version of someone's intestines. So let me just say upfront, the Buldang is certainly unique. The Buldang is a "de-structured, padded, and segmented tube" that's 30 feet long and billed as a modular armchair-sofa, because those are two of the things you can arrange it to make. But really you can turn it into anything you like, which is why, I suppose, that Hirohiko Kamiya's design is called a "modern object masterpiece" instead of "puffy sausage links." The Buldang is made from a cloth called "Climate Control" that has an organic, supple, human feel. Exactly what you want in your finer pieces of entrail. Not only is this wonder material both elastic and solid, it also has "resistance to rubbings." Thank goodness for that! Just $2,380 will buy this objet d'art for your home. Yikes. Wouldn't it be cheaper to make one yourself? Looks like a big sausage ring. Right on Sister! 15 sections in this thing, each about 2 feet long. You'll need about 12 yards of 44/45" wide fabric, counting the end circles and the take-up between sections. Gather the fabric onto a sturdy twill tape every 24 inches along the length of your 10-yard piece. Sew into a tube. Use resilient foam cylinders covered with about 3 inches of batting (wadding if you're English) for the stuffing. Gather the ends and hand-sew circles on to cover the opening and gathered seams. You can get sturdy upholstery fabrics, 54" wide, for as little as a few dollars a yard if you shop around. Foam and batting, maybe fifty dollars, more or less. The remainder of your savings will come in handy to pay your lawyer with if you actually do this and sell the pattern or the finished product. boy. girl. boy. boy. girl. girl. duvets. looking. for. funky. dressers. etc.